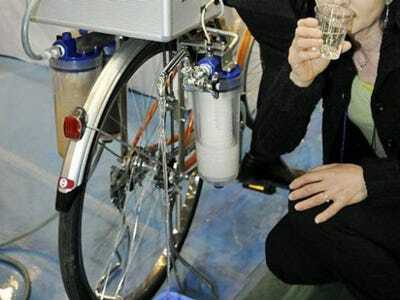 The idea: The CycloClean is a bike that purifies water as you ride it. It can process 5 litres of water per minute and should work for two years without needing a filter replacement. Plus, it’s tough—its tires are made for terrains that cars might not even be able to handle. Whose idea: Nippon Basic, a Japanese manufacturer. Why it’s brilliant: It might not catch on with the New York hipster crowd, but the Cycloclean might just be a lifesaver for people in the developing world or areas affected by a natural disaster. 42,000 people die every week from contaminated water and unhygienic living conditions. The only downside is the price. At $6500, the average person might not be able to swing it on his or her own. But it could be a great project for a charity, and in the meantime, for disaster relief groups. Have a million dollar idea of your own? Send it to [email protected] and see if it stands up to our critical readers. Just be sure to include your name and a photo of yourself, or your idea, in the email.